Sometimes it makes sense to place print ads in suitable publications to increase the odds that you will connect with the right audience. As much as we focus on online marketing, it doesn't always make sense to ignore what's happening and available in the print world. In fact, what you do offline can work with what you do online. 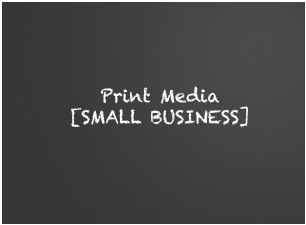 In other words, your print ad may direct people to a special page on your web site where they can provide contact information to connect with your small business. We’ll show you campaigns we’ve developed.